You never know when the apocalypse might hit, so why not spend a bit of time right now learning how to get around when the fuel supplies run out? When it comes to running cars on alternative, cheaper fuels, you’ve maybe seen a few ideas already. Recently our own Alex attempted to run Miles the high-mileage Skoda Octavia on used vegetable oil. And it worked. But what about running a car on firewood? Okay, so it’s not as straightforward as straining it about a million times and pouring it into the tank, but it’s possible on the right car, i.e. a Lada. 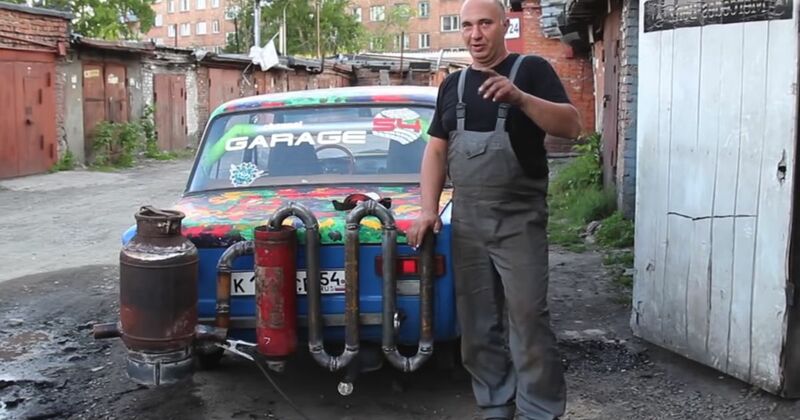 Enter the Russian maestros of weird modifications at YouTube channel Garage 54. In a two-part video, the guy who brought you tyres made of coil springs and filled another unwanted Lada with five tonnes of concrete has converted the latest donor car to run on burning firewood. By manufacturing a furnace out of an old gas bottle, the team initially tests it with charcoal and confirms that the system can produce flammable gases. It’s fascinating post-apocalyptic stuff. When it’s finally hooked up to the Lada… well, it doesn’t exactly work as planned. Recommended car throttle shop Worldwide Shipping In The CT Shop Car Throttle Submit Your Videos To Get Featured On Our Social Channels DIY That 'Half Price' Totalled Audi R8 Has Been Repaired For $500 DIY Here's What Happens When You Spray A Car With A 40,000PSI Jet Washer DIY Here's Why Putting Winters Tyres On Only One Axle Is Stupidly Dangerous DIY Here's What Happens When You Replace A Tyre With 3000 Nails DIY What Actually Is Rack And Pinion Steering? DIY Here’s Everything That’s Broken On A $25,000 Aston Martin DB7 DIY Here’s Proof That 4WD Is Useless On Snow Compared To Winter Tyres DIY Can You Run A Car With The Propshaft Connected Directly To The Engine?